I’ve been baking more bread lately, and most often I will make my dough ala Jim Lahey’s no-knead method with a 24-hour fermentation that develops the gluten and contributes full flavor. However, sometimes I won’t be able to bake bread 24 hours after I assemble the dough and require quicker turnaround. One trick for faking the flavor of a well-fermented bread is to use another fermented product: beer! And I have had plenty of beer on hand that I was in no rush to drink (namely the peanut porter). To make this bread I simply follow a recipe of 2% salt, 0.5% yeast, and 75-80% beer in baker’s percentages (weights given as percentages of the weight of flour). For a small loaf I might use 6-8 oz of flour, for a loaf to share I might use 12-16 oz of flour. You can see some of the gummy bit in the middle of the slices in back. 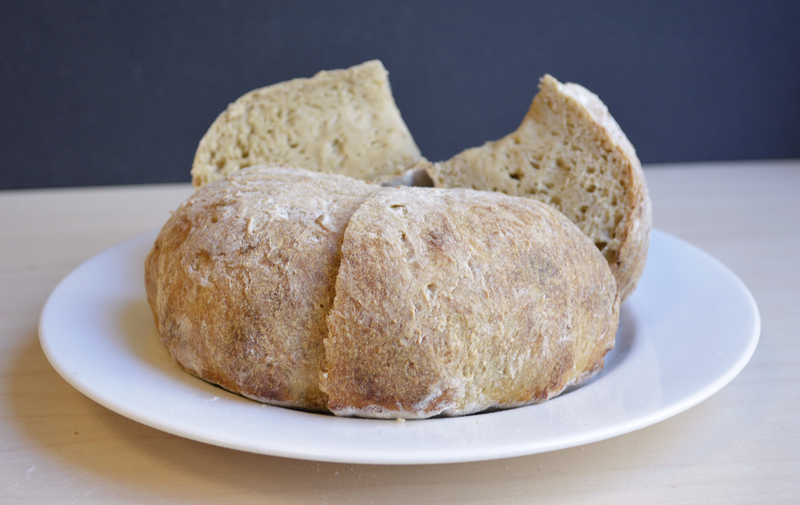 The first few times I made bread this way, the beer was very apparent, but not unpleasant. The beer contributed a boozy, vaguely peanut and chocolate character. The bread, baked on preheated stone at my oven’s max temperature, had a toothy crust with delicious, dark melanoidins. However, the last couple of times I’ve made the bread, the middle of the bread has been gummy and very unappetizing, and the flavor of the bread has been dominated by salt. I do not know what has brought these results about, since my method and recipe have gone unchanged. However, there is considerable variability in my fermentation and bake time that I haven’t taken notes on, and that could be to blame. On the whole, it’s kind of fun to bake bread made with beer, but I don’t think it’s a technique I’d make a habit of using except in those unfortunate times where it feels like a step up from dumping beer down the drain. Aroma: Like before, the prominent scent of pomegranate molasses, except a little more muddled. I couldn’t discern any other distinct aroma, although over time the beer took on a minty scent. Appearance: When held up to the light the beer appeared an inviting shade of pink, like grapefruit juice. On the table in our dim apartment, it looked ruddy and unappetizing. The pips do a funny dance up and down in the glass as bubbles of carbonation nucleate on them, carry them to the surface, and then burst letting the pip fall back to the bottom of the glass. Flavor: Muddled, with the molasses and fresh juice apparently clashing. Some kind of weird minty flavor results. The flavor of this did not appeal to me at all. Mouthfeel: Colleen wanted me to leave the pips in, and though she enjoyed them for me it was not a plus. They were distracting and didn’t add much novelty or fun factor for me. Puts a new spin on “chewy” as an adjective for beer. Overall: Colleen really liked it. I didn’t like it at all. Unfortunately, once she left the room I poured it down the drain, not realizing she’d asked me to save some for when she came back. 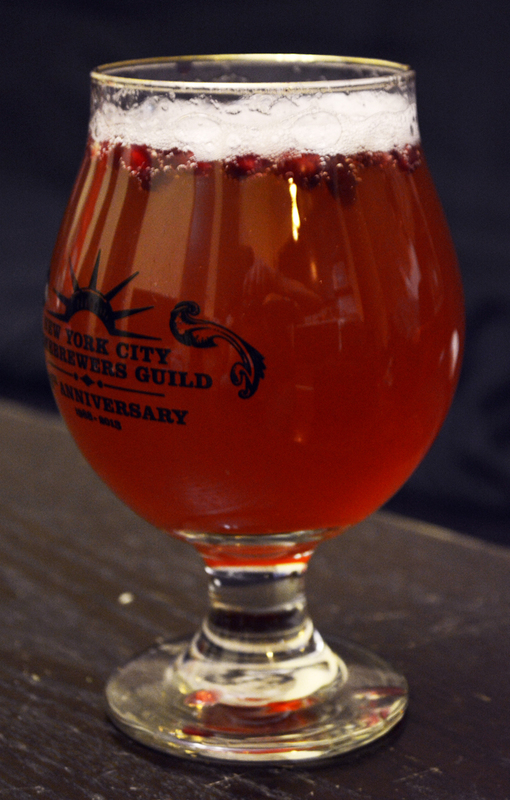 This entry was posted in beer, learning, tasting and tagged beer bread, fruit beer, no-knead, pomegranate, review, saison on January 18, 2014 by Dylan Bargteil.